William T. Wiley What's More in French, 1977 Mixed Media, 35" x 23"
William T. Wiley’s works on paper from the 70’s and 80’s represent his character and humor towards life and society. Wiley’s self-portraits exude his playful personality and “Imitation” of life. Robert Arneson once said: “All real art is self-portraiture”, suggesting artists project their own personalities through their work with themes and motifs. 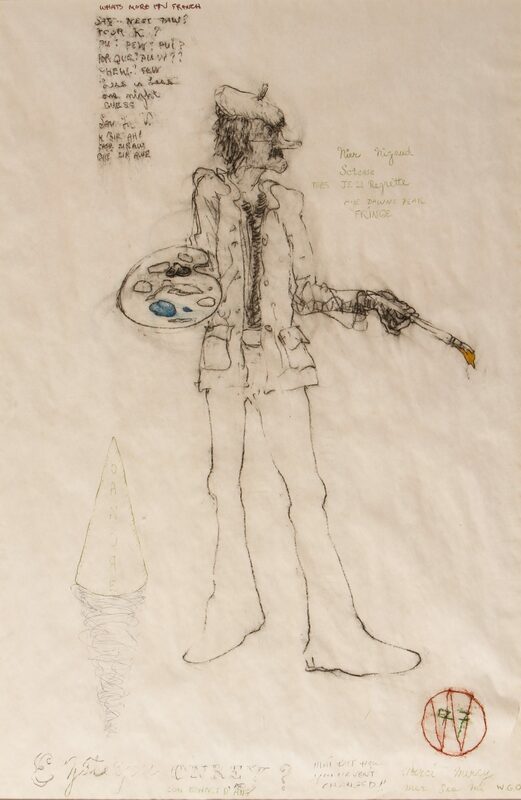 Wiley’s work moved in many directions influencing a great many artists including the anticipation of conceptual art. Art historian Thomas Albright defines Wiley as, “One of the pivotal figures in the transition between the funk art of the 1950’s with its lingering roots in Abstract Expressionism, and the more self-conscious Funk Art that followed. His attitude and personal style provided a model for the aid back life-is-art rusticity that became prominent in much Bay Area after the mid-1960’s”.